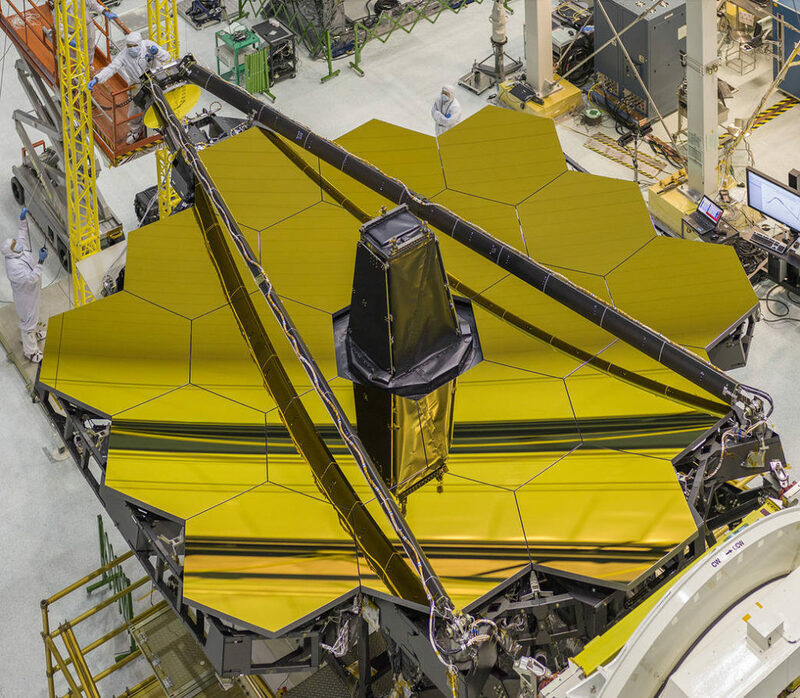 May 2, 2016 – NASA engineers recently unveiled the giant golden mirror of NASA’s James Webb Space Telescope (JWST) as part of the integration and testing of the infrared telescope. The 18 primary mirror segments, built by Ball Aerospace & Technologies Corp. in Boulder, Colorado, were individually protected with black covers until engineers removed them last week. JWST will be the most powerful space telescope ever built. The telescope is designed to see in a spectrum known as infrared, allowing it to look deep into space, beyond other stars. It’s unprecedented sensitivity will allow Webb to look back through time, up to 13.5 billions light years away, to the earliest moments of our universe. JWST will study many phases in the history of our universe, including the formation of solar systems capable of supporting life on planets similar to Earth, as well as the evolution of our own solar system. In order to see such far-off and faint objects, Webb needs a large mirror – how much detail a telescope can see is directly related to the size of the mirror area that collects light from the objects being observed. A larger area collects more light than a smaller one. Scientists and engineers determined that a primary mirror 6.5 meters (21 feet 3 inches) across would be needed to measure the light from the distant galaxies they hope to study. The mirror will be 2.5 times larger than the diameter of the Hubble Space Telescope’s mirror, making it the largest optical telescope in space. Making a larger telescope presented some unique challenges. If the Hubble Space Telescope’s mirror were scaled large enough for Webb, it would be too heavy to launch into orbit. JWST could only have one-tenth of the mass of Hubble’s mirror per unit area, so the Webb team would have to use material that is very light weight. At the same time, the telescope would need to withstand the extreme temperatures of space, operating at a temperature of roughly -400 degrees Fahrenheit. (-240 degrees C). To see the first stars and galaxies in the universe, astronomers have to observe the infrared light given off by them, and use a telescope and instruments optimized for this light. If the JWST mirror was the same temperature as the Hubble Space Telescope’s, the faint infrared light would be lost in the infrared glow of the mirror. To keep Webb cold, it will be sent into deep space, far from the Earth. Sunshields will shad the mirrors and instruments from the Sun’s heat, as well as keeping them separated from the relatively warm spacecraft bus. Another challenge for engineers is that at over 21-feet wide, the Webb mirror would be too wide to fit into a rocket. JWST is scheduled to launch on an Ariane 5 rocket, which has a maximum payload diameter of 5 meters. This is the reason for the segmented mirror. Segmented mirrors are frequently used on the largest telescopes on Earth because a solid mirror is difficult to manufacture and tends to distort over time, but the difference is that Webb will have to unfold and align itself in space. 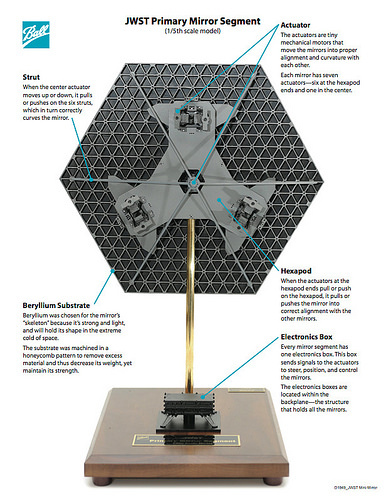 Engineers devised a folding framework that holds 18 hexagonal mirror segments. Each hexagonal segment measures just over 4.3 feet (1.3 meters) across and weighs approximately 46 pounds (20 kilograms). A full primary mirror segment assembly, including its actuator, is about 40 kg. Beryllium was chosen for the mirrors because it’s a light metal, but is very strong for its weight and is good at holding its shape across a range of temperatures. Beryllium is a good conductor of electricity and heat, and is not magnetic. A test team from Ball Aerospace worked with NASA engineers at Marshall Space Flight Center’s X-ray and Cryogenic Facility (XRCF) to cool the mirror segments to the temperatures Webb will experience in deep space. Ball Aerospace began cryogenic testing of the primary mirror segments began at XRCF in 2009. The change in mirror segment shape due to the exposure was recorded by Ball engineers using a laser interferometer. The information was used for the final surface polishing. The reflecting surface of each beryllium flight mirror segment was then coated in a very fine film of vaporized gold to improve the mirror’s reflection of infrared light into the telescope’s cameras. Essentially, the mirrors were put inside a vacuum chamber and a small quantity of gold was vaporized and deposited on the mirror. Areas that didn’t need to be coated were masked off. The gold is so thin that it would take about a thousand of these layers to equal the thickness of a standard sheet of paper. A thin layer of glass coating was deposited on top of the soft gold to protect it from scratches. After the gold coating was applied, the mirrors once again traveled to Marshall Space Flight Center for a final verification of mirror surface shape at cryogenic temperatures. Before launching, the mirrors will be folded up into a packaged array that will fit easily within the payload section of its launch vehicle. Once in space, the mirrors will unfold to create a honeycomb-like structure that will gather information about the history of the universe for years to come. 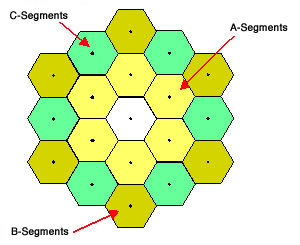 The hexagonal shape of each mirror allows the segments to fit together without gaps; if the segments were circular, there would be spaces between them. The overall mirror shape is roughly circular because it focuses the light into the most compact region on the detectors – an oval mirror would give images that are elongated and a square mirror would send a lot of the light out of the central region. Finally, the symmetry of the mirrors allows for three different optical prescriptions on the 18 segments, or six of each. Getting the mirrors to focus correctly on distant galaxies is another challenge. 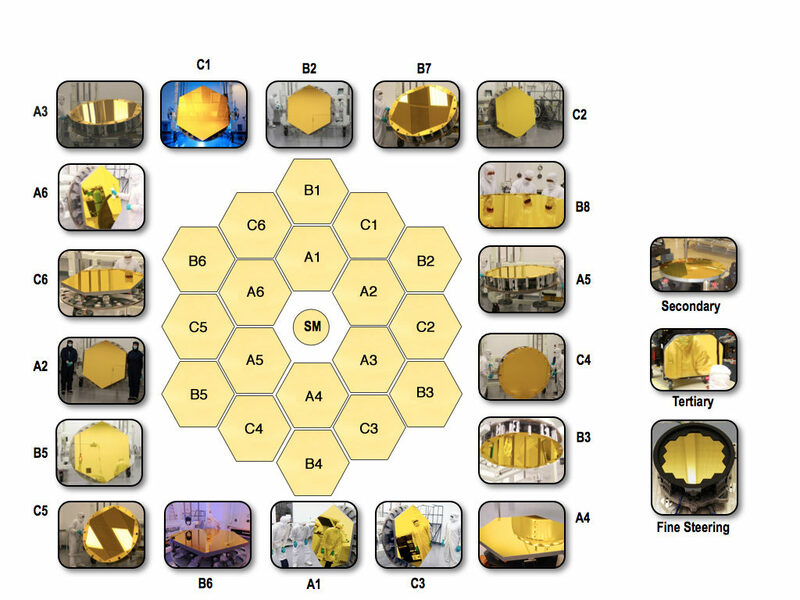 JWST will use a set of algorithms and software programs to determine the optimum position for each of the primary and secondary mirrors while the telescope’s tertiary mirror remains stationary. Six tiny mechanical motors, or actuators, are attached to the back of each primary and secondary mirror piece. The primary mirror segments also have an additional actuator at the center that adjusts its curvature. Each mirror can be aligned to 1/10,000th the thickness of a human hair to achieve precise focus. 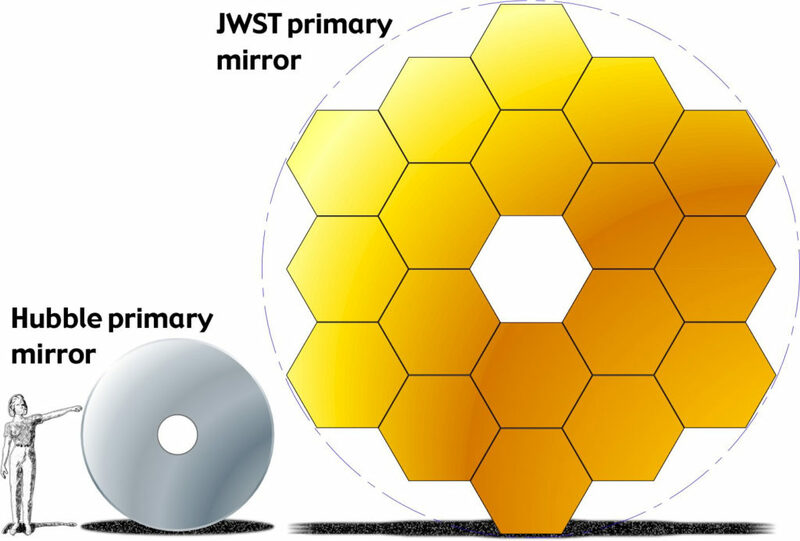 The primary mirror then performs like a single monolithic mirror with an effective f/number of 20 and focal length of 131.4 m.
JWST will be launched to Lagrange Point 2 (L2) about 930,000 miles (1.5 million km) from Earth, or four times father than the moon. L2 is one of five “Lagrange Points” where gravity from the sun and Earth balance the orbital motion of a satellite. Putting a spacecraft at any of these points allows it to stay in a fixed position relative to the Earth and sun with a minimal amount of energy needed for course correction. With JWST in the exact opposite direction from the sun, it will line up with both the sun and Earth. The added gravity of the two large bodies pulling in the same direction will give the spacecraft an extra boost of energy, locking it into perfect unison with the Earth’s yearly orbit. The Webb telescope will be placed slightly off the true balance point, in a gentle orbit around L2. From here, the Webb telescope will enjoy an open, unimpeded view of the universe. JWST is named for a former NASA administrator who is most commonly linked to the Apollo moon program. James E. Webb ran the space agency from February 1961 to October 1968. Webb believed that NASA had to strike a balance between human space flight and science because such a combination would serve as a catalyst for strengthening the nation’s universities and aerospace industry. Webb’s vision of a balanced program resulted in a decade of space science research that remains unparalleled today. In the next few months, engineers will install other key elements and take additional measurements to ensure the telescope is ready for space. JWST is targeted to launch from French Guiana aboard an Ariane 5 rocket in 2018. Webb is an international project led by NASA with its partners ESA (European Space Agency) and the Canadian Space Agency. The lead contractor on the project is Northrop Grumman Corp.
Ball Aerospace is the principal subcontractor to Northrop Grumman for the optical technology and lightweight mirror system and is responsible for the primary, secondary and tertiary mirrors. In addition to 20 optical assemblies, Ball is developing the cryogenic electronics used to align and phase the optics in flight; cryogenic radiator assemblies; wavefront sensing & control software to determine the motions necessary to phase the telescope in flight; and optical system engineering support.